IMPORTANT: Please note this is a custom dorm item and takes 14 business days to produce before shipping. Dorm Co. Tip: A dorm product that has two functions is a solid find! Dorm trunks are one of the best dorm essentials you can go dorm room shopping for. You will absolutely love having a college trunk once you add one to your college supplies. If your dorm trunk is sitting out in your college dorm room, it can add to your dorm room decor, but it is also a functional dorm essentials product that you will adore having in your dorm necessities. Moving to college can be incredibly stressful. You have to pick and choose what to bring from home, which is stressful enough but the worst part is getting those college supplies into your car and then into your college dorm room. Enter your dorm trunk. Your dorm trunk will make packing up those dorm essentials easier and it will make getting them into your college dorm room a lot easier. 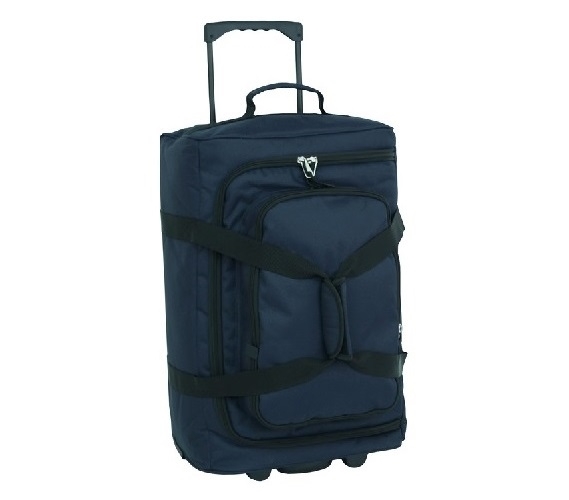 Our Micro Monster Bag Trunk in Midnight Blue is one of those multi-functional dorm necessities that are fantastic. It is airline compliant as carry on luggage, can be used to pack when moving in and out of college, and can even be used as dorm room storage. Don't use this college supplies product only for moving - when you get to your college dorm room, use it for extra dorm room storage of seasonal clothes, sweatshirts, or other dorm items you don't use often. This storage trunk has an extendable pull handle and inline skate wheels to make transporting your dorm necessities easy - you can simply pull them along. This dorm trunk has a spacious interior with a mesh pocket and a large dorm organizer pocket on the outside. Plus our Micro Monster Bag Trunk in Midnight Blue is incredibly durable. Made of 600D Polyester Canvas, this dorm trunk is built to last!